Will Ferrell is joining the ranks of Willie Nelson, Tina Fey, Jeremy Lin and Jerry Garcia — albeit through his alter-ego, Ron Burgundy — with the release of his own namesake flavor of Ben & Jerry’s ice cream. "Scotchy Scotch Scotch" — inspired by Ron Burgundy’s penchant for swilling shots behind the news desk — is tied to the upcoming "Anchorman 2: The Legend Continues." No, there’s no real booze in it — the “scotch” is really butterscotch, and you have to be a big fan of the sweet stuff to enjoy this one: butterscotch ice cream laced with ribbons of butterscotch swirl. To kick off sales of the new flavor, Ben & Jerry’s staged a press event Tuesday in New York City, where a flock of 20 Ron Burgundy look-alikes jumped out of an ice-cream-truck-turned-Channel-4-news-truck. The flavor is now available in participating scoop shops across the country, but you’ll have to wait another few weeks to find it in grocery stores. And you’ll have to wait even longer for the "Anchorman" movie sequel, which hits theaters December 20 from Paramount Pictures, whose execs had a hand in the flavor development. 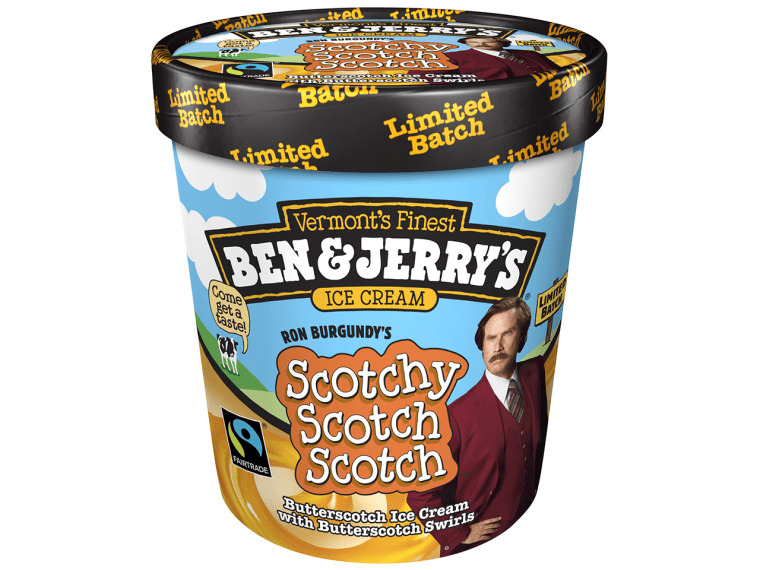 Only time will tell if Scotchy Scotch Scotch will make it into the ranks of celeb-inspired flavors that earned more of a permanent home on shelves — such as Stephen Colbert’s AmeriCone Dream (vanilla with fudge-covered waffle cone pieces and caramel), Jimmy Fallon’s Late Night Snack (vanilla bean with a salty caramel swirl and fudge-covered potato chips), and the time-tested Cherry Garcia — but right now, it’s only a limited release. Of course, the anchorman himself thinks highly of it. What do you think? Will you give the new flavor a try?